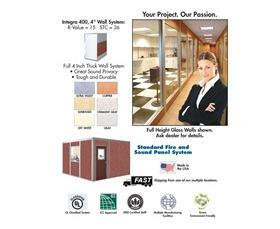 8 ft. High Panels, Raceways, Framing Channels, Fasteners, Hardware and Easy Step Installation Instructions. 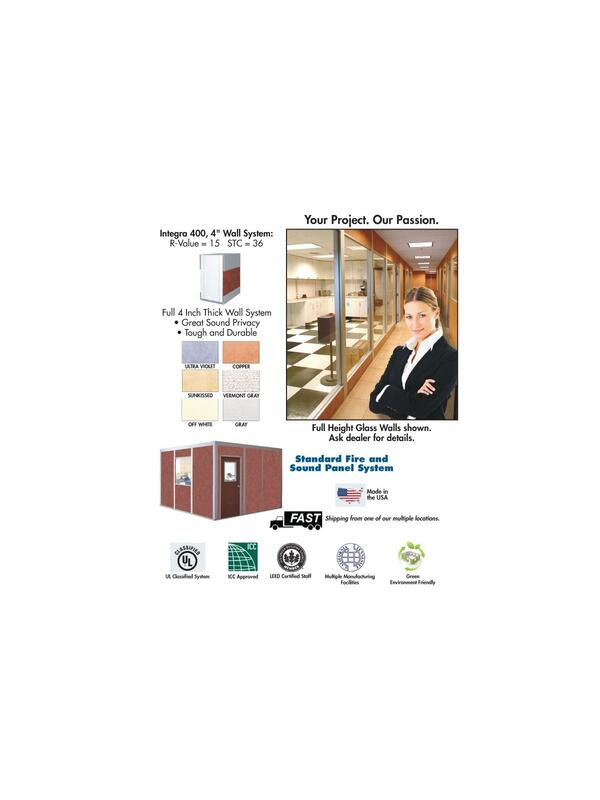 Energy Efficient T-8, 2 x 4 Fluorescent Inlay Lighting (bulbs not included) . UL Classified Raceways, UL Listed Outlets and Switches (Modular Wiring Optional - Snaps Together in Minutes). Anti-Corroding Tempered Aluminum Frame System. Pre-Hung Hollowcore 3068 Door with Grade 2 Locking Knob. Commercial Grade 2 x 4 Grid Ceiling System with Fissured Tiles. 20-gauge Ribbed Steel Roof System. Single Phase Breaker Box (Breakers included). Complete Bill of Materials and Floor Plan. Update to Designer Colors free! Choose from SunKissed, Copper or Ultra Violet. Standard Colors are Off-White, Gray or Vermont Gray. Please specify color in comments section when ordering. No Patching or Painting. Easy to Clean. 1/2" Class "A" Vinyl Clad Gypsum laminated to both sides of the Insulating Polystyrene Core per ASTM-E84. Fast Shipping from one of our multiple locations. Economical 2 Inch Wall System Available - Call for Pricing. See Related Items tab for Integra 400 Accessories.